Overload Relay is used to Protect Electric Motor from failure due to a high current is drawn by the motor. An electric motor has 33% of its cost in total Air Compressor unit, so it is our duty to protect Electric Motor from any type of failure. Every engineering people must have to take care of their equipment. Overload Relays are the only salutation to protect the motor from high current. Overload Relays are generally of two types one is “Electromagnetic overload relay” and another is “Thermal overload relay”. In this post, you will find details about “Electromagnetic Overload Relay” which is somewhat outdated nowadays, but still, some old Air Compressor units are having these types of Relays. The Electromagnetic Overload Relays consist of a coil or solenoid carrying the line current (or a portion of it through current transformers) with an armature which when attracted sufficiently operates the release circuit or latch. A time lag feature is incorporated to guard against unnecessary operation from temporary Overloads due to the normal operation of the machines which are being driven. The time lag is obtained by means of Dash pot (otherwise the action would be practically instantaneous) fitted to the Oil Circuit Breaker (OCB) controlling the stator circuits. The time lag consists of BODY CASTING, MOVEABLE PLUNGER, and OIL RETAINING SCREW CUP. The moveable plunger comprises the core of the Overload release, to which is fitted a specially shaped brass disc moving in a restriction in the body casting, by turning the screw cap the position of the disc within the restriction is varied. The time lag is dispatched dry and must be filled with special time lag oil (SAE-60 grade). 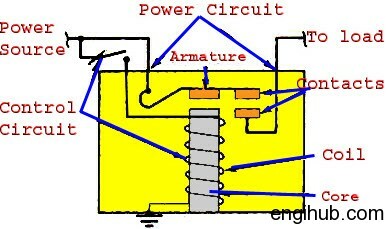 Provided in separate containers in the Circuit Breaker. While fitting removes screw “A”. It is not necessary to remove the bottom cup “B” and on no account should screw “C” be removed. Adjustment of the Overload setting is made by slackening screw “D” and sliding the body casting up or down, until the top face coincides with the calibration marking required on the calibration tube, screw “D’ is then tightened. The bottom rotatable cup “B” is now described reset themselves after operation within few second. This type of Overload Relay is very simple in operation but due care must be taken for the accurate operation. All the marks “A”,”B”,”C”&”D” are embossed on respective spaces, you have to identify first before working on “Electromagnetic Overload Relay”.